The Diva asked us to go big, and I used an apprentice tile (11.5 x 11.5 cm) I cut myself. It was made from Paint-on paper by Clairefontaine, and it has a bit rougher texture than the Bristol paper I usually use, but not too bad. 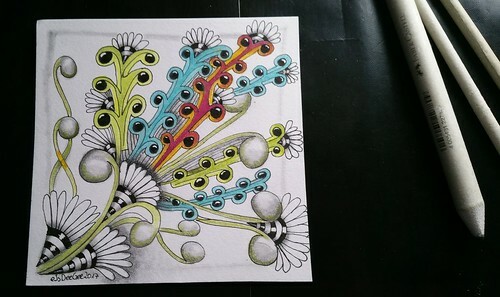 I used micron pen, pencil, and Polychromos colored pencils for this tile. Tangles used are Dewd, the new tangle from the Headquarter, plus Mooka (also HQ) and Peek-a-boo Daisy (by Tricia Long). If you want to share your art with me and others, please come to my facebook group Tangling Practice. This group is fairly open to any art form containing either tangling or doodling, also in form of canvasses and mixed media, not only drawings of tiles etc. Love the combination of tangles that you used. Fun color too! This is lovely and has a fun feeling.